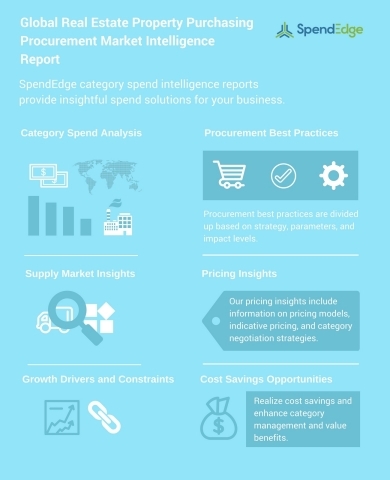 LONDON--(BUSINESS WIRE)-- Global procurement intelligence advisory firm, SpendEdge, has announced the release of their ‘Real Estate Property Purchasing Procurement Research Report.’ The insights and data in this report provide a strategic analysis of the supply markets, factors influencing purchasing decisions, procurement best practices, pricing models, supplier landscape, and an analysis of the supplier capability matrix for the facility management industry. This report breaks down the data and analysis behind the procurement of real estate property purchasing and acts as an all-inclusive guide for making smart purchasing decisions. “The growth of the global real estate property purchasing market is driven by the strong economic growth in emerging economies such as countries in APAC, including China, India, Vietnam, South Korea, and Malaysia,” said SpendEdge procurement research analyst Suraj Kumar S. “Another key factor driving the market growth is the leasing or renting of commercial properties, which acts as a consistent source of income,” added Suraj. Strong economic growth of emerging countries leading to high employment rate and increased purchasing power of end-customers. This is driving the need for commercial spaces which attributes to the growth of the property purchasing market. Purchasing managers need to ensure that in case of investments in new construction properties, suppliers must look for customization and documented amenities. However, new construction properties have certain risks associated with it that include a delay in possession and high costs. Finding suppliers with an extensive knowledge of all properties and a significant experience for the acquisition of different types of properties such as retail, office, and industrial is one of the key challenges faced by purchasing managers in this market. The cost approach is a widely accepted pricing model in the property purchasing market as it helps purchasing managers in knowing the overall worth of the property, which includes depreciation, construction cost, and cost of the land. Moreover, it helps to determine the total cost of the property by summing the estimated value of the current construction cost of a structure and the value of the vacant land. According to SpendEdge analysts, the income approach pricing is a high potential pricing model, and purchasing managers must implement it in the forecast period. This pricing model is suitable for apartments, offices, buildings, and malls as these generate regular income. Furthermore, income approach is applicable in estimating the value of income producing or investment properties.